My first Mac was really my roommate's first Mac - until I got my own. It all started back in 1989, when all I would hear in the middle of the night was that rat tat tat of a typewriter banging away. It was my roommate typing out his invoices and reports to mail to his clients. In the daylight, I looked at some of these papers lying about and noticed that their formats were all the same. He was typing the same thing over and over again for different clients, but with different titles and figures. I asked him, "Why don't you get a computer?" Being a theater arts major who never took any computer courses, he did not know a thing about computers, let alone what one could do. A friend of mine showed us his Macintosh. My roommate's eyes lit up when my friend demonstrated the ease of the Macintosh operating system and the intuitiveness of the desktop, the files, and the mouse. A week later, we picked up a SE/30 along with a HP LaserJet IIP printer, a handheld scanner, and a Hayes 2400 baud modem for $4,000. It would have cost even more had we not let another friend purchase it for us through the university's book store. It was a sweet little machine, with it's 9-inch black and white screen, 1 MB of memory (expandable to 4 MB), and a 30 MB hard drive running System 7.5. Within two days the typewriter was in the trash, and I was sleeping better at night. My roommate quickly learned that all he had to do was type his reports once, and then simply change the titles and the numbers, then rename and save them to reuse again the following week. His job was a lot easier. Shortly thereafter I added more RAM to the machine to bring it up to 2.5 MB. With the Hayes modem and Prodigy, we got our first taste of the internet. It was slow but fun. Several years passed, and one day the hard drive died. The local shops wanted too much to replace it, so I ordered a hard drive through a computer magazine and replaced it myself within half an hour. Then in 1996 the happy Mac face did not greet us as he had done so faithfully for the last seven years; instead a sad one was in his place. We rushed our friend to the nearest authorized Apple repair center to learn that his motherboard had died - it would be more economical to purchase a new machine. Our grief was short lived when we brought home a Power Mac 8500/120 with a 2 gig hard drive and a 15 inch color Sony monitor for $6,000. Thanks to PowerPrint, we were able to continue using the HP LaserJet printer. I then went out and picked up a US Robotics 28k modem. Now we were really cooking! Then in August of 1998, Apple introduced the iMac for just $1,300. I had to have one, even though I did not need my own computer. The only things that I used my roommate's computers for were surfing the net, chatting with friends, and playing games. And then there was the money issue. As a coworker saw me drooling over a photo of the iMac in a magazine, he told me that one of the advantages of working for a large corporation is it's computer purchase loan program. Well, the disadvantage of a large corporation is that it moves at a snail's pace. I applied for my interest-free computer loan in November 1998 and finally got it in June 1999. Little did I know that waiting was a blessing, for by this time Apple had released its fourth improvement of the cute cuddly machine. The very next day I was the proud owner of Hal 9001, a grape iMac Rev. D running at 333 MHz. Now we are a two Mac household. I loved Hal 9001 for six months - until the iMac DVs came out. 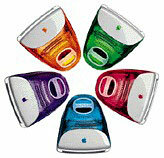 Then I just had to have one of those, especially the graphite one with its FireWire, DVD, and iMovie. And that is what I am typing this article on today, I sold my grape iMac to my brother, who is enjoying it with his family.